My review could be one sentence. Sibu sea buckthorn daytime facial cream is the miracle product my skin has been begging for. I suppose I should explain though, huh? I have had problem skin for as long as I can remember. Some days my skin looks awesome. Some days I can't bare the mirror. If my face isn't oily, it's dry. Right when I think I'm in the clear and have obtained adult skin, out pops a zit. I have slight rosacea that flares when it feels like it. I randomly get itchy dry patches around my eyebrows that don't want to be moisturized. Etc. etc. etc. I have lost track of the products I have tried on my face. Products that PROMISED results. With money back guarantees. I've been to the dermatologist. I've tried numerous prescriptions for all of my individual woes. A lot of things initially work but tend to have mixed results. One product was magic on my zits... but left me itchy and dry. One product seemed to "cure" my dry patched blotchy eyebrows... but was greasy and never really dried. Some of the prescriptions really did the job... but I don't necessarily want to use a steroid cream or antibiotic repeatedly forever. The praise and complaints go on and on (and probably sound familiar to a lot of people). 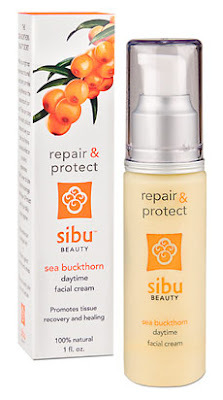 I was sent a bottle of sibu Sea Buckthorn repair & protect to try out. When it comes to my face I'm pretty happy to try things out since I'm always hoping to come across the miracle that will work for my skin. But... I also always expect them to fail. I have been using sibu repair & protect for about 3 weeks now. My dry patchy eyebrows are completely smooth. I have actually had 2 different people comment on my skin. I put moisturizer on each morning and my skin still feels smooth and moisturized all day long. I do have a random zit right now (so it hasn't cured that) but I'll dab on my prescription to quickly deal and the sibu should help the dryness quickly. My one real complaint? I don't like scented face creams. Actually... I pretty much hate scent on my face. Sibu's sea buckthorn berry has a citrus scent. It is a light scent though, and while I wasn't a huge fan when I first started using the lotion, I have gotten used to the initial application scent and then it fades pretty quickly. I will deal because I no longer have to itch my eyebrows and blotchy cheeks. Positives about sibu repair & protect daytime facial cream: - My dry patches are gone, people. GONE. If that isn't moisturizing and "tissue recovery and healing" I don't know what is. - Not at all greasy. - My skin felt soft and moisturized throughout the day. Negatives about sibu repair & protect daytime facial cream: - It has a scent. If you hate scents in your face cream... it might bug you when you put it on. - While it does "rejuvenate sun damaged skin" it does not have an SPF factor. It is nice when your face moisturizer has that added benefit. If you are chosen as the winner of the giveaway your product will be shipped directly from sibu. Disclosure: I was sent a bottle of sibu Repair & Protect daily facial cream. A matching product was provided for a reader giveaway. All opinions expressed in this post are my own... and my non-patchy moisturized skin is proof!